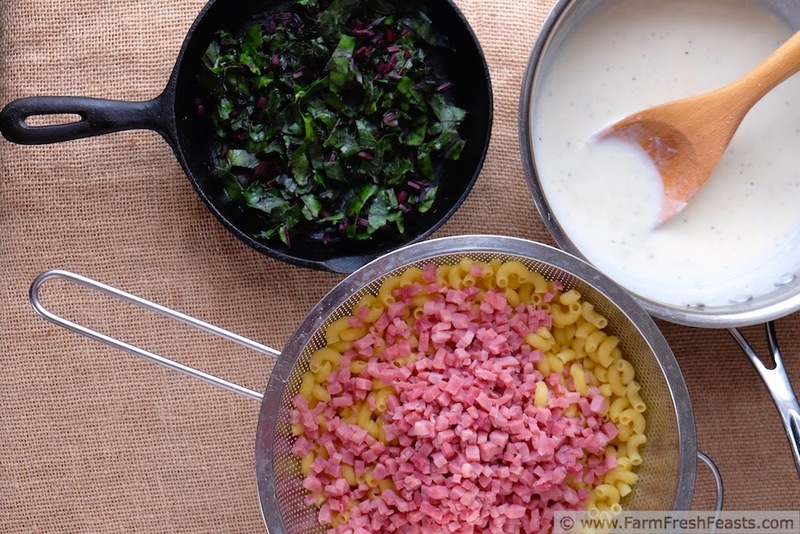 Classic comfort food with a colorful boost from beet greens and ham. Last week on my FB page I posted a photo of the greens that were overwhelming me. My friends came to my rescue with great ideas that helped me come up with A Plan. I'm happy to report that there are no mustard greens left--except in leftovers that will be eaten at lunch. I also gave away lettuce, peppers and a kohlrabi to 3 neighbors, freeing space in my fridge for marked down milk and the box of #FreakyFruits that arrived from Melissa's Produce [more on that as I play with it--but I'll tell you that finger limes work nicely in a mustard greens kheema]. I'm feeling a lot better about using all the wonderful produce from the Community Supported Agriculture (CSA) farm share. Sometimes it is hard to be inspired by the contents of the fridge, freezer, and pantry as a base for dinner. It's easier to grab something at the store than to remember to thaw a package of meat or a bag of pizza dough. It's easier to nuke a prepared entree than to boil noodles. I know how I sound--because it's October, the month where sled hockey, marching band, and sewing converge to keep my family hopping in ways we are not during the other 11 months of the year. This too shall pass! As the weeks speed by I find myself craving comfort foods but lacking time to prepare them. As a result, sometimes for a weekend lunch we sit down to a homey baked mac 'n cheese casserole only because I finally had time to make what I'd been hankering. Cooking a few casseroles on the weekends provides leftovers for us to eat on the fly. 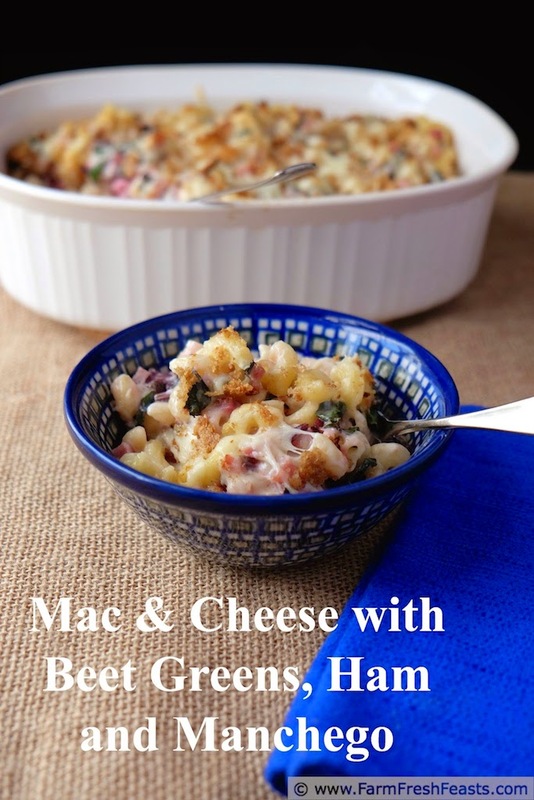 The inspiration for this mac and cheese came from the wonderful cookbook MELT (link to the authors' website). I first raved about this cookbook when I received a free copy and made Mac and Cheese in a Pumpkin last year. Then I made a Pasta Salad with Grilled Fruits and Goat Cheese in the spring. This book really gave me the tools to make macaroni and cheese. 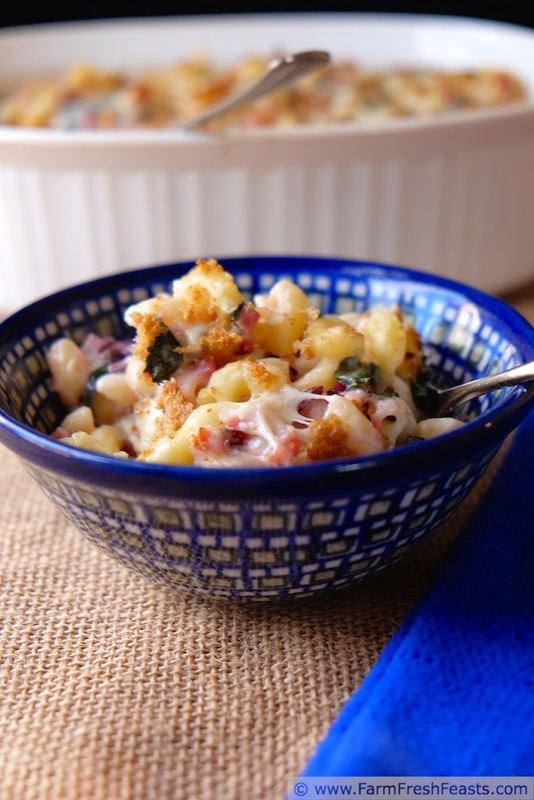 Now I've been schooled in the The Art of Macaroni and Cheese (Amazon affiliate link) enough to spread my wings and try a creation of my own, using the ingredients I've got on hand. 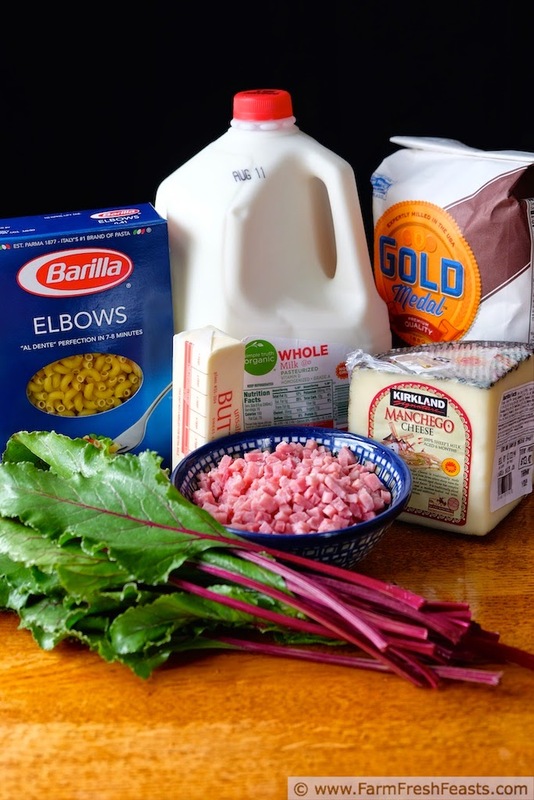 For other recipes using Beet Greens, please check out my Beet Recipe Collection here. Preheat oven to 350 degrees Fahrenheit. If you haven't cooked your macaroni--get a pot of salted water going and pour the milk into a microwave safe container while you're at it. Grease a 2 ½ quart casserole dish and set aside. Preheat a medium skillet over medium heat and add a bit of cooking oil, maybe a teaspoon. Sauté the beet green stems for 5 minutes or so until softened. Add the leaves, stir to coat with oil, and sauté until wilted, another 3 minutes or so. Set aside. In a medium saucepan over medium heat, melt butter. Stir in flour and cook until lightly browned. Pour in warm milk in small amounts, stirring or whisking in between each addition. Add cheese, a handful at a time, stirring until incorporated. Once all the cheese is added, add salt and pepper then cook and stir a few more minutes until thickened. Season with nutmeg and set aside. 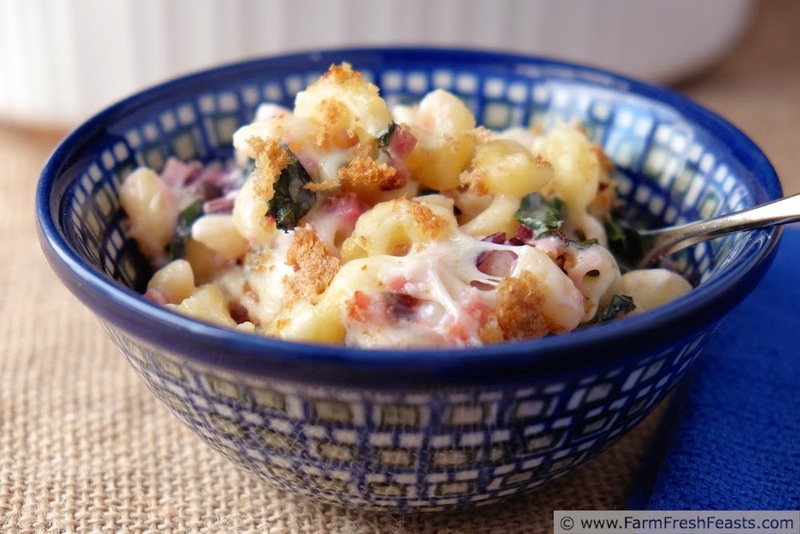 In a large bowl, combine beet greens, cooked noodles, ham if using, and cheese sauce. 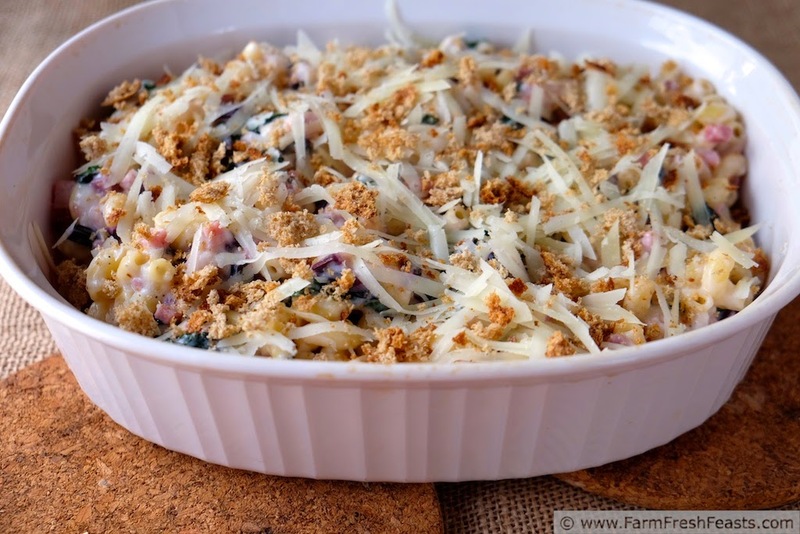 Dump into prepared casserole dish and top with extra ½ cup shredded cheese and bread crumbs. Bake for 25 minutes or until top of casserole is lightly browned. You had me at macaroni and cheese and then continued to pull me in when you referred to The Plan. I've given away our last two heads of lettuce and I still have more in the crisper. We've actually been eating out lately or getting home from work so late, we don't eat (or we eat potato chips and dip for dinner...mmmm), so cooking has been minimal, which means my fridge and counters are packed with produce. Guess what I'll be doing today? Yup, cooking all the foods. I had a rough stretch where I could NOT get on top of the farm share, but I think (hope?) I'm pulling out of it, thanks to The Plan. I'm probably on Plan AA version 3.4 at this point, but there's still A Plan.